A recent Auburn Citizen article presented an excellent overview of water quality policy issues surrounding Cayuga Lake, with many insights and quotes from EcoLogic President Liz Moran. 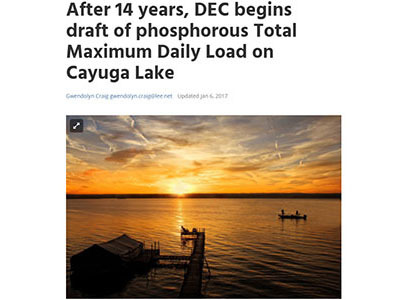 EcoLogic has been working with Cornell University on mapping and modeling sources of phosphorous pollution in the Cayuga Lake watershed, and has also worked with Cayuga County on watershed management planning for Owasco Lake. Read the full article.